CPR Educators is an American Heart Association Authorized Training Center in Charlotte, NC focused on teaching lifesaving skills in an engaging, hands-on way. Every class is taught by a certified instructor who has extensive experience in teaching first aid and CPR classes in addition to having a professional background in emergency care. They are not only extremely knowledgeable about the course content, they know exactly how to apply lifesaving skills in real-world situations. 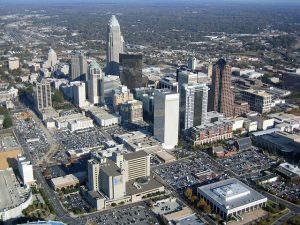 Why Take Charlotte CPR Classes? We work with individuals and businesses across Charlotte and throughout North Carolina, providing first aid, AED training, and CPR classes. While many of our students take classes because of job or legal requirements, the real reason to take emergency training courses is to save lives in the event of an emergency. First aid and CPR training gives you the confidence and knowledge necessary to take action during an emergency where every second counts. Whether the emergency is with your child, a patient, or even a stranger, you’ll be empowered to immediately step in and lead the situation and improve their likelihood of a successful outcome. CPR Educators makes sure that by completing our Charlotte CPR certification class, you go beyond meeting legal or job requirements and are able to truly save a life. We offer several types of emergency training courses at our training center in Charlotte, from Automated External Defibrillator, or AED training, to classes specifically for pediatric CPR. We limit class sizes to ensure that not only are they fun and engaging, but it also gives our instructors the opportunity to provide personalized, hands-on instruction to ensure every student understands the material and knows how to apply it in an emergency. This course is specifically designed to care for babies, toddlers, and children during an emergency. We recommend parents, babysitters, and child care workers, in addition to anyone who is responsible for a child’s wellbeing, take this class. The Basic Life Support (BLS) CPR class is customized for healthcare professionals and caregivers to teach them cardiovascular life support skills and CPR. This class focuses on providing emergency care in both healthcare and pre-hospital settings. Heartcode® BLS combines online learning with a classroom setting, perfect for those with busy schedules or students who require a self-paced course. Part of the class is online while hands on instruction and skills assessment are on-location. For Charlotte employers whose employees need to meet OSHA Standard 1910.1030, this course provides comprehensive instruction in how to handle blood and other fluids while keeping safe and preventing the spread of disease. For employers seeking compliance with OSHA Standard 29 CFR 1910.157, we offer fire extinguisher training to teach your team how to safely and effectively respond to a fire and use an extinguisher safely. Our American Heart Association Authorized Training Facility provides multiple Charlotte CPR classes each month. These are perfect for individuals who need to recertify or for parents, caregivers, and teachers who need to know how to respond during an emergency. For Charlotte organizations who want to ensure their team maintains emergency training and CPR certification, we offer onsite instruction and certification. Whether you are a small company or a large corporation, we offer small, enjoyable classes for your crew to ensure they are compliant with your certification needs. Our on-site first aid and CPR classes are perfect for healthcare offices, such as dentists or chiropractors’ offices, day care centers, and home health companies. Our instructors will happily customize each class to your profession to ensure the best education for your team. If you need to schedule emergency training, or you have any questions, we’re happy to help! Reach out to us today at (919) 639-4848, send us an email, or fill out our contact form.